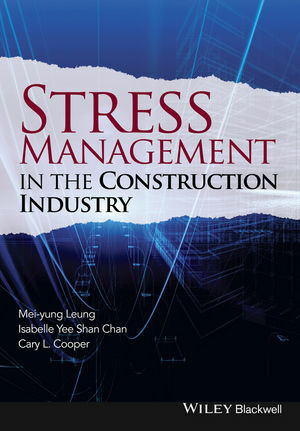 This systematic review of stress management in construction will help an understanding of the issues and theory as well as offering practical recommendations. Dr Mei-yung Leung is Associate Professor of the City University of Hong Kong, PRC. She has more than twenty years of practical/teaching experience in the construction industry/education and has participated in a number of prestigious construction projects in Hong Kong. She has over 150 international publications in various research areas covering stress management, construction project management, value management, facility management, and construction education. Up to the present, she has attracted over HK$ 15 million in the capacity of investigator in both professional and research projects. Dr. Leung has successfully completed all levels (including the teaching level) of the Mindfulness-based Stress Reduction training at the University of Massachusetts in the USA, and conducted various stress management seminars and full course to construction companies, professional institutes, higher educations and religious organizations. She has received a number of international awards, including the Tony Toy Memorial Award issued by the Hong Kong Institute of Value Management in Hong Kong, the Thomas D. Snodgrass Value Teaching Award issued by the SAVE International "The Value Society" in the USA, and the Teaching Excellence Award issued by the City University of Hong Kong. Dr. Leung is also a senior Fulbright Scholar at the Pennsylvania State University and University of Southern California. Dr Isabelle Yee Shan Chan is lecturer at the University of Hong Kong, PRC. She is the author of over 40 international publications in books, journals and conferences, covering areas of stress management, health and safety, culture, and innovation in construction. In line with these research areas, she has participated in more than 10 research projects in the capacities of principle investigator, co-investigator and project coordinator. Stress management in construction is the research area of her PhD study; she has also successfully completed the mindfulness-based stress reduction program in the Hospital Authority in Hong Kong. Dr. Chan is the vice-chairman of the Institute of Safety and Health Practitioners in Hong Kong, and is also a visiting fellow of Hughes Hall of University of Cambridge in the United Kingdom. Professor Sir Cary Cooper is Professor of Organizational Psychology and Health, Lancaster University Management School, UK. He is the author of over 120 books (on occupational stress, women at work and industrial and organizational psychology), has written over 400 scholarly articles, and is a frequent contributor to national newspapers, TV and radio. Professor Cooper is a Fellow of the British Academy of Management and also of the Academy of Management (having also won the 1998 Distinguished Service Award). In 2001 he was awarded a CBE in the Queen's Birthday Honours List for his contribution to organizational health, and in 2014 he was awarded a Knighthood. Professor Cooper was the lead scientist to the UK Government Office for Science on their Foresight programme on Mental Capital and Well Being (2007-2008). He was appointed a member of the expert group on establishing guidance for the National Institute for Health and Clinical Excellence on "promoting mental wellbeing through productive and healthy working conditions", 2009. Professor Cooper is Chair of the UK's Academy of Social Sciences (an umbrella body of 47 learned societies in the social sciences; and was Chair of the Chronic Disease and Wellbeing Global Agenda Council of the World Economic Forum in Geneva in 2009.